Well we are that point in our life again, we think our son is ready to learn how to go the toilet all on his own so yesterday I got the potty down from the loft were it has lay dormant for nearly 2 years. Gave it a quick clean and now it stands pride of place in my living room. Yes the thing is in my living room. There is reason behind the madness when we potty trained Elizabeth we had a down stairs loo so potty sat in there, however this house has an upstairs loo and the speed Andrew walks he would have crapped up my stairs before he got to the potty so it was living room or kitchen. Living room won, there is nothing better than watching the crap on tv with a baby crapper looking at you in the face with its little smiley face. I’m looking at it now and I have to be honest I am not looking forward to it. I don’t know how others potty train there is so many ways of doing it so many websites out there giving you advice, your health visitor says one thing, your mum says another and your mate down the road says one thing and they all say your doing it wrong if you don’t do it their way. I am going to tell you how we did it with Elizabeth and what we think we will be doing with Andrew. Before I do I will say this and it’s important if there is anything you take from this blog let it be this, every child is diffrent, there is no right or wrong way of looking after your child, many people will tell you what you should be doing or they wouldn’t do that or even they did it differently when they had kids. Please don’t let anyone tell you that you are doing it wrong, listen to them and find a way that works for you.. if at the end of it they are using the potty that is all that matters. This point stands with anything you do with your little one potty training, feeding getting them to sleep, I could go on. So all that said let me tell you how we did it with Elizabeth and what will be the starting point with Andrew (although I am sure we will have to change it). 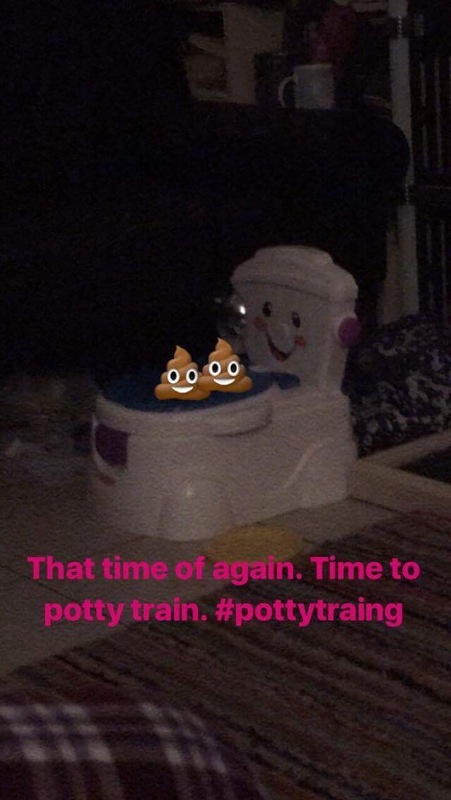 I’m not sure how to discribe how we chose to potty train I suppose it was a similar way to how you would train your pet (but I hate to discribe it like that as it sounds bad). The first thing we did was put the potty in the room so she could get used to sitting on it and start to get used to it, then when we thought she was ready when ever we were in the house it would be off with the pants and nappy and we would just follow her around with a mop and When she did anything we would just say something like “oh well you’ve had a little accident we need to do wee wees and poo poos on our potty” then we would pick her up and just put her on the potty and hope she would eventually realise that’s where she needs to go toilet, we had mixed success with this part of the problem we found was because she didn’t have any pants on she would do a wee and just walk off. We noticed when she had a nappy on she knew when she had a wee, because of the wet feeling of the nappy. So I stocked up on knickers and we decided it was time to change it up a bit. We still followed her around with a mop but this time she had knickers on so if she had an accident she would feel wet and come and tell us she’d wee’d or pooed sometimes upset we would reassure her and tell her it’s ok but when she feels like she needs a wee or poo she needs to use the potty so she wouldn’t feel ikky. Eventually one day she took herself to the potty and used it for the first time and pooed. I don’t know why she got the hang of pooing first but she was soon potty trained for poos very quick wees took a little longer, we had a few accidents and when we werent at home she was in pull ups for about a month or so but after about 3 months she was fully potty trained in the day. We had to take her potty to nursery as she wouldn’t use there Loos but even that only lasted a few weeks until she got used to there loos. I have to say I can’t remember when it all clicked in to place it just seemed like it happened one day and we haven’t looked back since she now uses our big toilet although she still wears pull-ups at nights but that’s something that we can work on with time. So that’s how we did it with Elizabeth and how we will start with Andrew we will most probably end up tweeking it as like I said before every child is different and different things will work with different children. I said before I am not looking forward to doing it with Andrew not because it’s difficult or that I find it stressful it’s just because i don’t like cleaning wee and poo up if I could skip that bit I would be ok, but at the end of the day the final result is worth it and will cost me a lot less as I won’t need to buy nappy anymore. But I am getting ahead of myself we have only just got the potty out so now we are trying to get Andrew used to sitting on the thing and we now have a summer of wet floors cleaning up poo and trying to find out the best way that works for our son, I am sure there are to be many more blogs about our nappy to potty journey. « Kids tv, are you for real?